Gardening and being out in nature, have long been recognised as good for our souls. So much so that in the 1800’s patients in mental health institutions were being encouraged, as part of their therapy, to work on the grounds and farm. Since then scientific research has shown that gardening reduces depression and anxiety, improves self-esteem, lowers blood pressure and improves our overall physical health. Personally, gardening is something which I have always found instinctively beneficial. I have fond childhood memories of my parents giving me a little spot in our garden where I planted fox gloves and decorated it with stone ornaments. A few years ago the benefits of gardening were brought home to me when I suffered a bereavement in the Spring. Getting out in my garden and seeing the season come to life really helped me through that difficult time. So, just what is it about gardening that is so good for us? When you are struggling with depression it is common to lack energy, enthusiasm and motivation, so gardening may feel like the last thing you want to do. However, a particular type of Cognitive Behavioural Therapy called ‘behavioural activation’ advocates getting active in order to reignite that lost motivation and energy. Gardening is perfect for this as whatever the season there are always jobs to be done from pulling up weeds, to planting bulbs and watering during dry spells. These kinds of activities help us to focus on the future, have a goal to aim towards and to feel responsible for something. It’s so rewarding to look out on your garden, to see the bulbs you planted last Winter poking through the soil heralding the start of Spring, and maybe even to eat your own homegrown vegetables and salad. I wrote about the benefits of physical activity for depression and anxiety in my August 2018 Ramble and gardening is a great way of increasing your physical activity. It’s also something which you can tailor to your own physical abilities, ensure that you set realistic goals, take your time and ask for help with heavy jobs if you need to. Research has shown that when we exercise our brains release ‘happy hormones’ called endorphins, which have been scientifically proven to lift our mood and reduce anxiety and depression. We also produce more dopamine and serotonin, which are believed to help our brain cells to communicate with each other more effectively. Exercise through gardening can help us to develop stronger healthier muscles, loose weight, manage chronic pain and long term health conditions better and boost our immune system. As I discussed in my April 2018 Ramble, mindfulness is all about paying attention and this doesn’t have to be confined to sitting on a meditation stool surrounded by incense, you can be mindfully active and gardening is perfect for this. I know that when I am gardening I can become completely absorbed in the task at hand – not thinking of the million and one other things which are usually racing through my mind. When I am gardening I can ‘just be’. This type of mindful activity is perfect for reducing depression and anxiety. It takes us outside of our heads and helps us to focus our attention on something tangible, something which we have control over. Gardening is an activity which engages all the sense – sight, smell, sound, touch and taste (well a cuppa and biscuits are compulsory) and when we can truly focus on all of these senses we can enjoy that lovely free, grounding, calm feeling known as mindfulness. 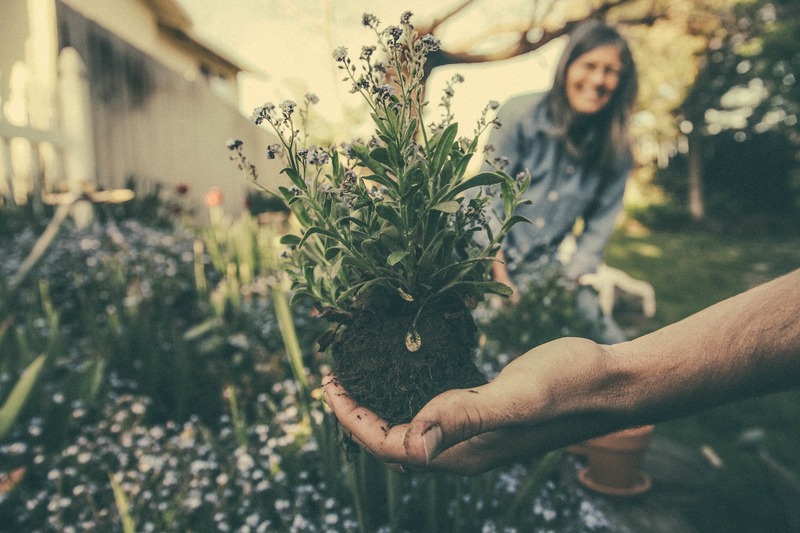 Gardening with or for others is a great way of overcoming isolation and loneliness. I know that I often don’t get much done when I go out in my front garden because I’ve been too busy chatting to the neighbours! Remember that when you are tending to your front garden, balcony or window boxes it’s not just you that benefits but everyone who passes by. Local organisation Crosby and Waterloo in Bloom are particularly good at advocating this with volunteering projects and awards ceremonies which encourage local businesses, residents and schools to brighten up our community. If you want to garden with or for others there are lots of volunteering opportunities and local organisations out there – see below. You don’t need to have your own garden to benefit from this stress reducing activity. Perhaps you have somewhere you can have house plants, hang some baskets, pots or window boxes. Perhaps you could help a friend or a relative with their garden. Rent an allotment or help out at a local park or voluntary group. Royal Horticultural Society – Founded in 1804 and is todays leading gardening charity in the UK. Thrive – A charity using gardening to bring about positive changes in the lives of people living with disabilities or ill health, or who are isolated, disadvantaged or vulnerable. Gardening for Mindfulness by Holly Farrell – a beautiful and informative book published by the RHS. Volunteer Centre Sefton – search here for local gardening volunteering opportunities. Green Gyms – A programme aiming to provide people with a way to enhance their fitness and health whilst taking action to improve the outdoor environment.